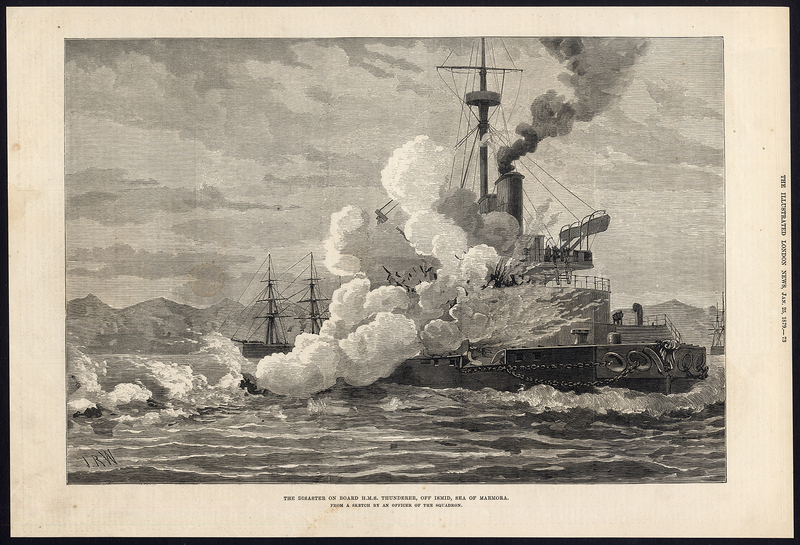 Subject: Plate : 'The disaster on board HMS Thunderer, off Ismid, Sea of Marmora.' An explosion aboard a steam ship. English text on verso. Condition: Very good, given age. Faint dampstain in the left margin, cluster of tiny stains in the bottom margin. General age-related toning and light staining/soiling from handling as visible on image. Please study scan carefully. Size (in cm): The overall size is ca. 37 x 25 cm. The image size is ca. 31.5 x 21 cm. Size (in inch): The overall size is ca. 14.6 x 9.8 inch. The image size is ca. 12.4 x 8.3 inch. Description: This antique print originates from 'The Illustrated London News'. The Illustrated London News was the world's first illustrated weekly news magazine; its inaugural issue appeared on Saturday, 14 May 1842. The magazine was published weekly until 1971, and less frequently thereafter. Publication ceased in 2003. This plate was published 1879. Artists and Engravers: This plate engraved after Weedon.